CHARLOTTE OLYMPIA'S NEW SPRING/SUMMER SHOES ARE HOT! There's nothing wrong with being a bit literal... especially when you are Charlotte Olympia and your latest collection for Spring/Summer 2017 is entitled Let's Go Bananas! We are loving this tropics-inspired collection of funky footwear that would have Caren Miranda sighing with envy. The Bananas is my Business shoe (above) is made of suede, nappa leather and wood and features the eponymous fruit along its outer edge, and more luscious fruits on the instep. 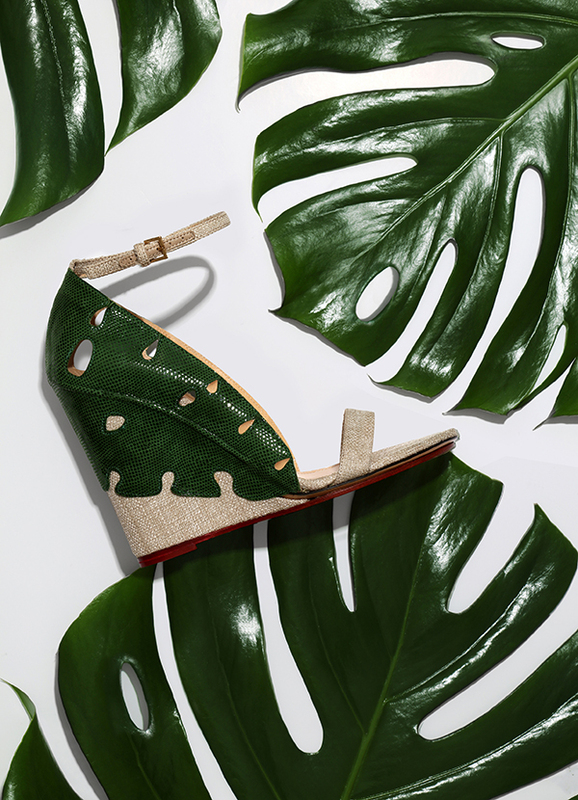 The Verdant Wedge (below) echoes the glossy sheen of banana plant leaves and consists of cotton canvas and textured suede. The entire collection is alive with 1940's Hollywood's depiction of Brazil and the shoes are simply made to Samba the night away in!